The Nike Junior Tour (NJT) USA National Masters tennis tournament was held Sept. 12-14, at Stanford University, for top junior tennis players in 12 and under (12u) and 14 and under (14u) age divisions. Tournament champions were extended an invite to the 2008 NJT International Masters, Oct. 12-19 at Club Med Sandpiper, Fla. The Nike Junior Tour (NJT) is a worldwide series of junior singles tournaments for boys and girls (12u and 14u), sponsored by Nike. The winner(s) of the USTA Sectional Championships/Qualifying Events are invited to compete at the NJT USA National Masters. Nike then brings together winners from the USA National Masters to compete at the NJT International Masters. USTA Florida players Julia Jones (Largo) and Alexandria Stiteler (Bradenton), have advanced to the NJT International Masters next month. Both Jones and Stiteler are first time competitors in the NJT. Jones, who trains with Maria Cercone at Bardmoor Golf & Tennis Club, was seeded No. 1 in the tournament and defeated the No. 2 seed in the finals to claim the 14u title. Stiteler, who was unseeded in the event, won the 12u division by defeating the No. 1 seed in just two sets. “I didn’t expect the final match to be as easy as it was, but I played really well,” said 12-year-old Stiteler. Stiteler had a tough semifinal match against No. 3 seed Cassie Mercer from USTA Midwest; however, with advice from USTA Florida coach Drew Evert and valuable training at the Celsius Tennis Academy in Sarasota, she pulled through. Jones struggled in her first round match against Maya Jansen of USTA Pacific Northwest and in her semifinal match against No. 3 seed Spencer Liang of USTA Mid Atlantic. She needed three sets and a combined 6 hours to win the matches, which placed her in position to win the entire tournament. Both Jones and Stiteler are tentatively ranked No. 2 in Florida and have shown tremendous improvement this past year. 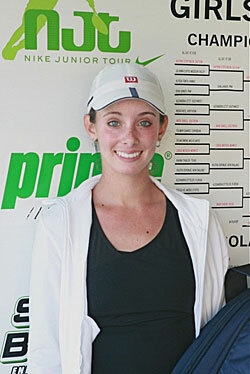 Jones won the 2008 USTA National Open (G14) in Largo and the doubles title at the 2008 Easter Bowl (G14) in California with partner Blair Shankle (TX). In 2008, Stiteler won the Gator Bowl (G12), Florida Open (G12), Tennis Plaza Cup (G12), USTA Florida State Closed Singles Championship (G12), several 14s and 16s Super Series tournaments and the Miami Dade Junior August Designated (G14). For more information, please visit www.nikejuniortour.com. Boys U14: Damon Niquet (#2 Seed), USTA Midwest Section defeated Jonathan Huang (#1 Seed), USTA Southern California Section; 6-2, 6-4. Boys U12: Deiton Baughman (Unseeded), USTA Southern California Section, defeated Timothy Kane (#3 Seed), USTA Eastern Section; 6-0, 6-4. 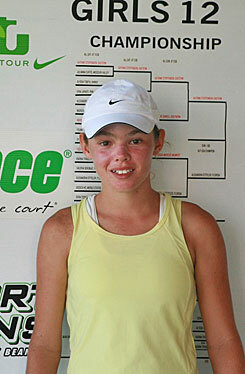 Girls U14: Julia Jones (#1 Seed), USTA Florida Section, defeated Brooke Austin (#2 Seed), USTA Midwest Section; 6-4, 6-2. Girls U12: Alexandria Stiteler (Unseeded), USTA Florida Section, defeated Katrine Steffensen (#1 Seed), USTA Eastern Section; 6-2, 6-1.